Panasonic introduces the latest generation semi-rugged laptop, the Panasonic Toughbook 53. With a 14" HD LED display, the latest Intel Core processors and an oversized multi-touch touchpad, it performs like a desktop. 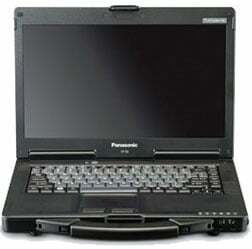 Options for a sunlight-viewable Panasonic CircuLumin touchscreen, backlit keyboard, 4G LTE mobile broadband, an integrated webcam and enhanced connectivity, make this the most versatile semi-rugged PC ever. Stylus pen for CF-74, CF-08, CF-30. The Panasonic CF-53STLLYLM is also known as CF-53STLLYLM	or CF53STLLYLM	.